Have you prayed the Stations of the Cross yet? No better time than Holy Week, especially Good Friday! The Happy Saints Way of the Cross eBook is great for kids, families, classrooms and parishes! 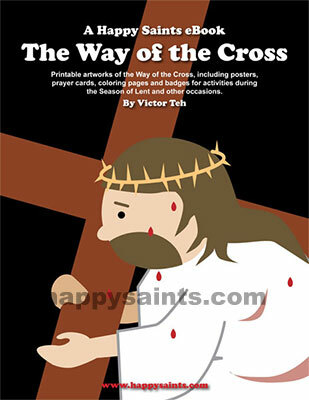 This PDF ebook features printable artworks of the 14 Stations of the Cross, a favorite Catholic devotion during Lent, including posters, prayer cards, coloring pages and badges for activities during the Season of Lent and other occasions. Great for children and adults alike at home, school or church!